This is the film that gave birth to the TV series "Dragnet" with Jack Webb. He even has a small part in this movie. The opening sequence of the TV show, with the Los Angeles Police Station and the voice over, are identical. 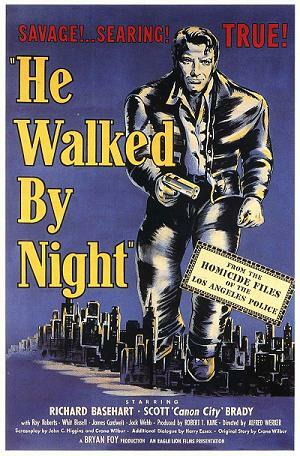 The film takes place in Los Angeles, shot on locations around the city, and involves a criminal named Erwin Walker, a brilliant thief and somewhat of a sociopath. The real kicker here is that this is a true story. At the close of World War Two, Erwin Walker is baffling the police all over Los Angeles as they search for a group of thieves. They are wasting their time. There is only one thief, and that is Mr. Walker, played in the film by Richard Basehart. By altering his modus operandi with each crime, he is able to lead the entire Police Department on a chase that has no apparent conclusion. 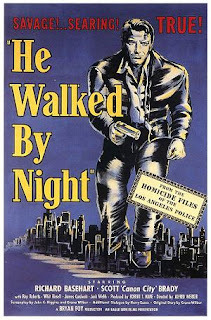 Until one night, when Mr. Walker makes a mistake, resulting in his fatally shooting a Los Angeles Police Officer. The investigation becomes a "Dragnet", as the police hunt to find the killer. The investigation leads the two detectives, Sgt. Chuck Jones (Scott Brady) and Marty Brennan (Roy Roberts) to an electronics dealer named Paul Reeves, who is able to put a face to the suspect. With no name to work on, the detectives embark on an exhausting, old fashioned manhunt, knocking on doors and rounding up all the usual suspects. Released in 1948, only one year after the case was solved, this movie was a real shocker at the time. Richard Basehart, who later on would portray the Captain on "Voyage to the Bottom of the Sea", was never in better form as an actor. His part is played with all the guile and cunning one would expect from the real Mr. Walker. Mr. Walker's preferred means of escape was through the vast system of Los Angeles' storm drains, which he used to great advantage in alluding the police. The scenes shot inside these tunnels are reminiscent of the sewer scenes in Orson Welles' "The Third Man", which was released the following year, in 1949. One can't help but wonder if Mr. Welles' effort was influenced by the true life crimes of Mr. Walker, or the film about them. With it's slow moving and methodical pace, this movie is immediately identifiable as the genesis for the later TV show "Dragnet", which first aired in 1952 and made Jack Webb a star.